The main entrance on Cataraqui street used to be the only entrance. The building's original brickwork has stayed mostly intact except for minor structural adjustments. The wooden floors are original, only polished. The large windows were to let in natural light which is essential for processing cotton and woolen fabrics. The 100-foot square chimney is used as a graduation determinate for the climbing gym in the basement. 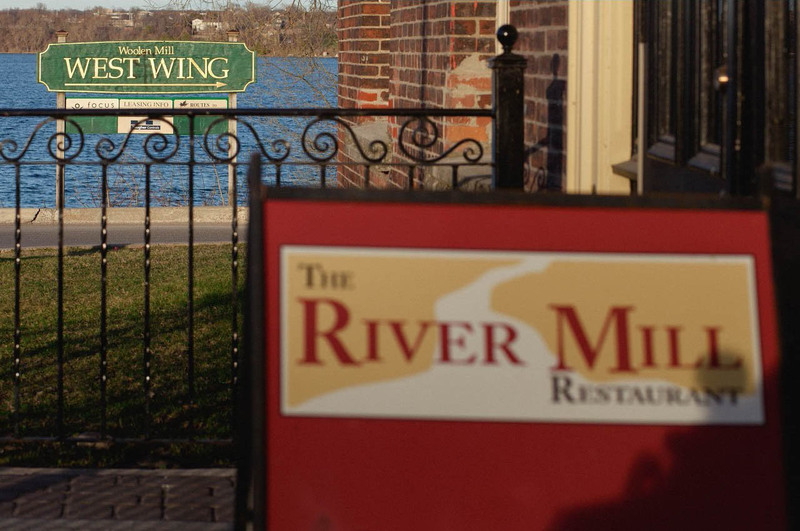 The building's oldest tenant, the River Mill, has been there since 1985. The mill endured the Great Depression and both World Wars, only experiencing inactivity for a total of under ten years in its 133-year life. 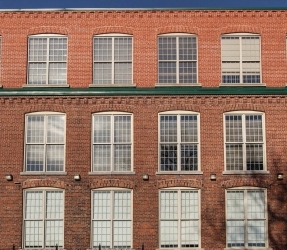 The Woolen Mill is a 19th-century building, and such structures were built to last. This four-storey red brick building was constructed in 1882 when a group of Kingston businessmen needed a place in which they could produce cloth. 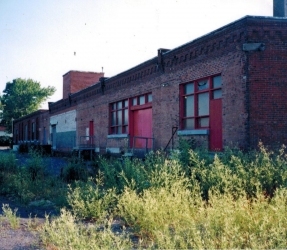 Erected on 'Farm Lot A' on a bank of the Cataraqui River known as the 'Inner Harbour', it functioned as a cotton mill for the Kingston Cotton Manufacturing Company, until about 50 years later when the City of Kingston purchased the property, intending for it to run as a woolen mill instead, under lease of the Hield Bros. of England. The mill thrived through and beyond the depression and the war. It wasn't until 1966 when synthetic fabrics gained momentum that the mill closed. Three years later St. Francis Developments took over and the building began undergoing renovations to section the open-concept building into office spaces for multiple businesses. 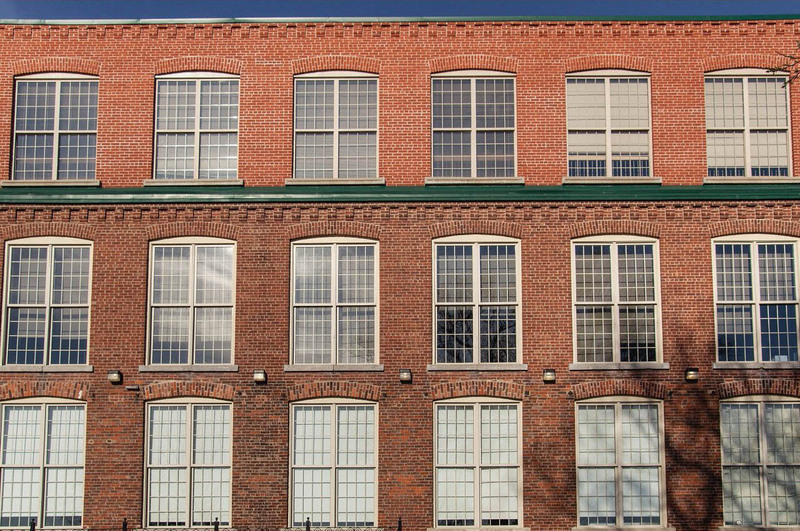 The mill has over 200 windows, 70 of which monopolize the North facade, which had the original singular entrance. The windows in the fifth floor of the rectangular tower were installed to replace two large double doors, which functioned as the only method of bringing large machinery and other materials into the plant. The most demanding job to have in the mill was a "mender", responsible for quality control of the fabrics. The large windows were essential to production, allowing bountiful natural light in order to properly inspect the fibres. The panoramic views from the top of the tower are breath-taking; of Kingston, of the causeway and the river, and the 1000 islands. During its first century, the building was maintained through a continual refurbishing program, allowing the ancient structure to survive and become the historic building it is today. In 1883, a single floor extension was added for the growing demands of cloth fabrics. The major additions and renovations began in 1993, all the while keeping the building's natural character in mind. The 130-year-old wood floors have been well-preserved with many coats of oil applied over the century. During restoration, the brick has been only sandblasted and pointed, and no treatment was needed whatsoever on the impressive 12 and 16-inch pine beams supporting the roof. These were put in place to fend off the snow as the building was built upon British plans, the specifications for which were modified for our Canadian climate. The foundation, built from local limestone, for which Kingston is very well-known, averages a thickness of three feet wide. 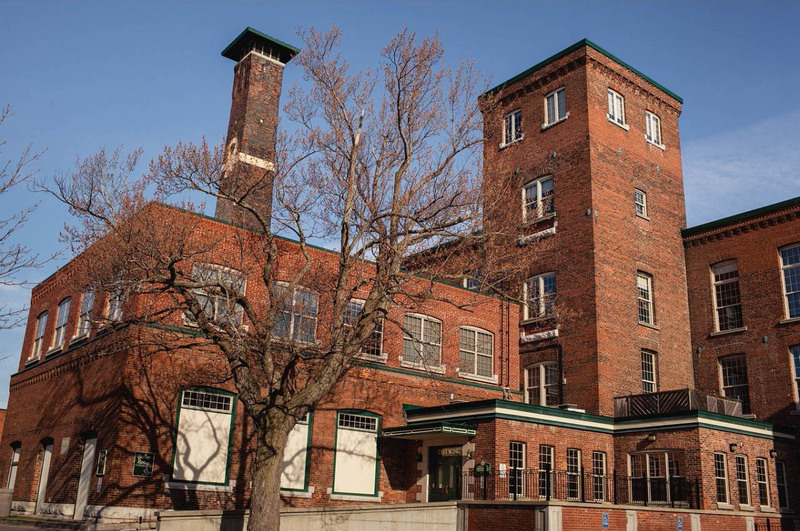 The recovery of the 100 foot high chimney was one of the most intricate projects of restoring the woolen mill, featuring challenging masonry and the complications of a post-tensioned structure. The Woolen Mill was originally built in 1882, making it 133 years old. 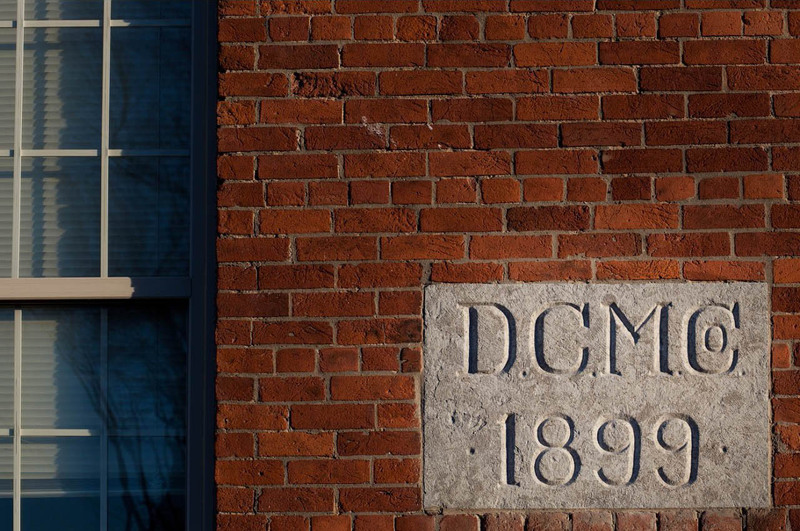 The longest-staying business was Dominion Textile Co., the original occupants, who operated for upwards of 50 years. Second in line and a very successful business, was Hield Bros. of England, operating for 35 years. 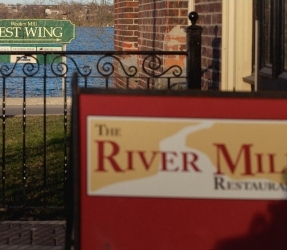 The longest-staying tenant is the River Mill Restaurant, built in 1985. The Kingston Whig-Standard used to take up the entire West Wing ground level, residing there since 1997. Other notable long-standing businesses are Shoalts and Zaback Architects, Events & Management Plus, and the Boiler Room Climbing Gym. The highest number of tenants at one time was 40 in the 80's under Wilf and Mary Eagle. The first occupant of the building was Dominion Textile Co., which manufactured cloth, and business boomed at first. In 1883 the single-floor addition was built to accomodate 100 more looms. The cotton mill functioned for nearly 50 years before succumbing to the oncoming depression. They endured for a while, but with little concern from the federal government (the Prime Minister called the unemployment crisis a "temporary seasonal slackness"), the manufacturing industry came to a grinding halt and the mill closed its doors. Thousands were laid off, evicted, and went hungry. Some children were excited to get a rope long enough to jump with for Christmas, and the province provided seeds that the residents were encouraged to grow for their families. Unemployment rates and tensions were high, and the municipal leaders seemed to focus on the tourism aspects of Kingston rather than alleviating the struggling work force. In order to create job opportunities and raise morale, a by-law was submitted by the manager of the Kingston Chamber of Commerce to lease the building to the Hield Bros. for an incredibly inexpensive amount (to attract their business), with the ability to purchase the property at any time during the five-year lease. In return the city placed on the Hield Bros. high-expectations for staffing and minimum wages, to be met by the time their business was fully established. Even though the mill was returned to operation in 1931 with some reservations, the initial 50 looms couldn't meet production demands. The annual payroll steadily climbed, new looms arrived, and by the end of 1936, 150 employees were operating 130 looms. This kind of progress was remarkable considering that the world was still reeling to recover after the Great Depression. Hield Bros. experienced decades of success as a woolen mill creating job opportunities and enduring through World War II, all while maintaining full production force and keeping workers' morale high. In 1944 they exercised the option to purchase the property from the city of Kingston. The woolen mill didn't close until 1966, when synthetic fabrics came to the foreground of the manufacturing scene with the inventions of textiles like dacron, polyvinols and acrilics. Artificial silk (known as rayon) was the first to start this trend, and between 1949 and 1954 17 Canadian mills closed and reduced 43% of the working population to unemployment. When St. Francis Developments of Montreal took possession of the property in 1969, they did so with the intention of converting it into a viable commercial space. However, they were unsuccessful in attracting lessees into this large, empty building at first. The structure had received no improvements or reconstruction since the day it was vacated by the Hield Bros. The majestic building had fallen from grace due to deterioration and heavy vandalism. It would be difficult to invest in upgrades when financial recovery was dependent on this abandoned property's rental income. It was fortunate that Kingston's Industrial Commission, established in 1960, had been working diligently to attract new industries to the city. The first tenant in the mill was Kingston Spinners, a US manufacturer of carpet fibre, funded by the Ontario government's $475,000 Industrial Incentive Loan. Occupying about 40,000 square feet of the mill, Kingston Spinners brought the textile industry of Kingston back to life, operating out of the old mill for five years while they awaited construction of their own plant on Dalton Avenue. The resident manager of St. Francis Developments held the community in high regard, and after partitioning much of the first and second floors into more practical workshops, his diligence paid off and the mill was able to accommodate a growing list of tenants. In 1983, Wilf and Mary Eagle from Montreal purchased the mill. 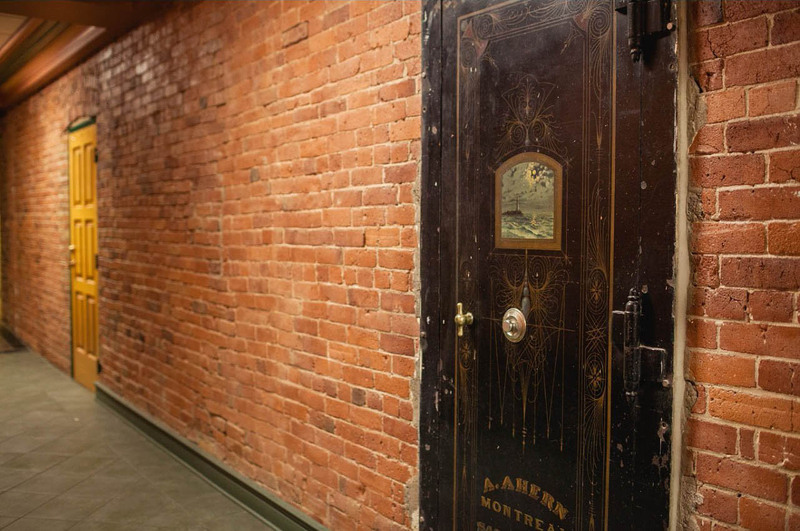 Along with John Hanson of Ottawa and years of experience renovating Montreal buildings, the Eagles updated the mill into an "incubator" in which start-up companies could grow. Thanks to this economical rental space, many of these companies were able to flourish. This eclectic group of young companies became an integral part of the mill, and after a very successful open house in 1985 there were 31 tenants sharing this century-old space. It was this open house that moved Clark Day to build the River Mill Restaurant, one of the longest residents on the property, overlooking the Cataraqui River on the whole east portion of the first floor. 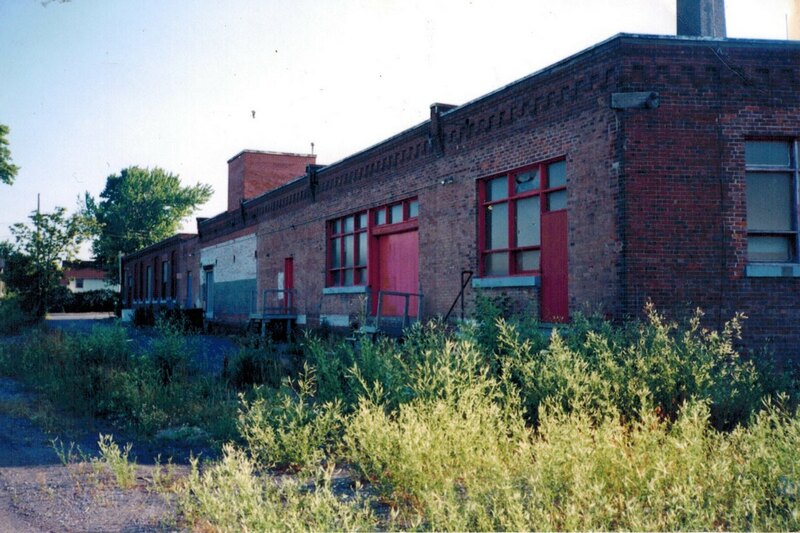 On May 12, 1987, The Woolen Mill was declared an historic building. The eastern section where the River Mill resided had the only walls that had been insulated. Due to the cold and a thieving problem involving easy-access fire escapes and a flee across the adjacent river, the occupancy of the Woolen Mill fluctuated between a devastating 14 and promising 40 over the next decade. Unable to turn the property into a break-even - let alone profitable - venture, the owners decided to sell. Banks and financial institutions were involved, and the mill's ownership sat in limbo for a few years until the current owners, Abna Investments, came along in 1993. Abna Investments assigned H. R. Doornekamp Construction Company to carry out repairs and refurbishing to the heritage building, all while keeping the authenticity of its original structure and features intact. With these ongoing improvements, their efforts and dedication was rewarded with a victory in Kingston's "Livable City Design" program in 2001. To this day, the tenants of this beautiful waterfront heritage property share a real pride in the building and in Kingston as a whole. It is a wonderful place to work, being close to nature and wildlife, with views of the river, free parking, and a stone's throw from historical landmarks and downtown amenities. 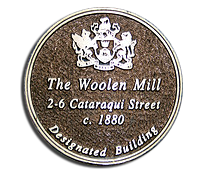 The Woolen Mill and the business within it have a robust history. Contact us to find out more about how you can be a part of this amazing diverse community.